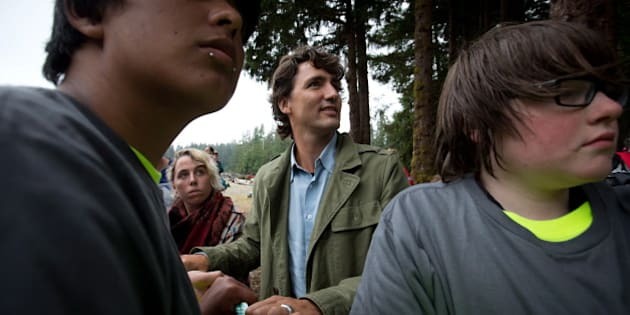 Liberal leader Justin Trudeau was in Gwaii Haanas Thursday for the Legacy Pole ceremony. "Honoured to attend a beautiful and historic Legacy Pole Raising ceremony at Windy Bay in Haida Gwaii today," he tweeted. Trudeau attended the ceremony with his family, wife Sophie Gregoire and their children Xavier and Ella-Grace, even helping to hoist the pole the height of a three-storey building. He had been spotted earlier in the week by the mayor of Queen Charlotte, Carol Kulesha, who told the Queen Charlotte Observer Trudeau was walking around the community ballfield with his children when she stopped to chat with him, telling the paper, "He was his usual charming personality". Trudeau has been traveling across B.C. on an informal tour/ vacation with his family, that included a hike to pay tribute to his late brother, Michel. Hundreds gathered in the Gwaii Haanas National Park Reserve to watch the nearly 3,000 kilogram pole raised using six ropes and sheer manpower, the first such raising in over a century. Spectators were dwarfed by the colourful and intricate pole, which took more than a year to carve and paint and represents Gwaii Haanas' modern and ancient history. The pole was created to celebrate the 20th anniversary of an agreement between the Haida Nation and the government of Canada that allows both to co-manage and protect the region. The ceremony Thursday took place on Lyell Island, where the Haida Nation led a political standoff in 1985 to protest logging in the area. Many commented on the emotional nature of the event. "It brought tears to my eyes," Olivia Edwards wrote in comments on the live stream site. "I have no words to describe the emotions that have consumed me. The tears flow easily," said LeeAnn Hughes. "So very proud and grateful for who I am." Although the totem pole was raised in celebration of the co-operation between Haida Nation and the government, its meaning extends beyond the 20-year anniversary of the agreement. Ten months ago, a 7.7-magnitude earthquake struck Haida Gwaii, triggering tsunami warnings and halting hot water from flowing into Hot Springs Island in Gwaii Haanas. CORRECTION: A previous version of this story incorrectly referred to Trudeau as the opposition leader. This version has been corrected.